We are so excited about today’s giveaway from Caden Lane. For one, we love Caden Lane’s beautifully designed, quality crib bedding; secondly, we love the designer, Katy Mimari, our dear friend and PN contributor. She has such an amazing eye for mixing and matching patterns that result in a unique and stunning effect. You love Katy’s design eye too—her daughter’s nursery is one of our most viewed nurseries in the gallery, and of course, it’s decked out in Caden Lane crib bedding. Now one of our readers will win a complete crib bedding set of your choice from Caden Lane (a $399 – $450 value!). That was just a small sampling of the lovely Caden Lane crib bedding sets that are available. Make sure you check out the selection on their website. Boy, girl or gender neutral, you’ll find a bedding set that can truly be the focal point of your nursery. Caden Lane even offers big kid bedding for when your little one outgrows his or her crib; not to mention, sweet accessories in some of the same eye-catching fabrics found in the bedding sets. WIN IT! One Project Nursery reader will win a complete crib bedding set of your choice from Caden Lane (a $399 – $450 value!). Gallery Roundup: Red, White and Blue! I like the Ryan bedding since we have a boy, but all of the girly stuff is SOOO cute! i like the preppy navy boy crib bedding! I like the Coral and Gray set! I love the aqua & coral crib bedding! I would love this for our little girl to come room!! they are all adorable! I would go with the first one, since I’m not sure if we’re having a girl or boy, and I love the colors!! Love Love Love Caden Lane!!! navy blue boy bedding for sure!!!!! Love the Coral & Grey Crib bedding! Bright Baby Green Crib Bedding I LOVE the mix of colors and know I couldn’t have thought of doing this myself. Beautiful!! I like the Carey bedding. So colorful and fun! The bright baby gray is gorgeous! Bright baby gray is gorgeous! The Coral and Gray set would be PERFECT for my baby girl who is due to arrive in the next couple of weeks! I love the coral in the first pic! Love the Bright Baby Gray! I love the Asher bedding! I would choose the Sweet Damask Lace Crib Bedding. So beautiful! I love the lavender, lace, and primrose bedding. The colors are so gorgeous! The Gage Ikat Collection would be perfect for my baby boy coming in September! The Parker bedding set is adorable. I also Love Love Love the orange/green/blue set from the pictures above. love all of the bedding from Caden Lane! I really love the Lacey Dot bedding! Perfect for our “surprise” baby! The bright navy stripes set is ah-DOR-able! Hard to pick between the coral and aqua or coral and gray. Love them both! Love the Pink Truffle Crib Bedding Set!! My main color is turquoise so Ryan Bedding is the perfect way to go! I love the Vintage Grey! I love the Ashlyn bedding. Lime, Orange and aqua! Love it! I love the green and blue polka dot bedding! The lime, orange, and aqua bedding is so cute! I like them all but would probably choose the vintage grey. Love the Aqua Coral Set!!! I did not see the dark blue from above, or the lime green and light blue from above, listed on the website? Those two are my favorites! The dark blue being my top! I had a crib bedding for my son, but his father and I split up and he would not let me have it. He was very childish about things. So now my son does not have any bedding for his crib and sleeps with me, but I need to start fixing that. What better way to start than with a beautiful new bedding set! I like the preppy navy set! The girly coral rose bedding is my favorite! I have been looking everywhere for bedding for my daughter’s nursery and that would be just perfect! I really like the one pictured above, the blue and orange one, but since I can’t seem to find that one of the website, my favorite one on the site is the Asher Bedding. I can’t get over how beautiful the Coral and Grey set is. I love the Preppy Pink bedding set! I love the Finley set! I love all the frilly girls’ bedding! I love the grey and coral! I would pick the Hayden Bedding set. I like the Sandbox crib bedding! I love the Vintage gray bedding! LOVE the Girly Purple Leopard Crib Bedding. Thanks so much for the chance! I love the Bright Baby Green Crib Bedding, especially since we don’t know if we are having a boy or a girl. I would like the Avery bedding. Bright baby grey crib or Sean bedding! I love both just can’t make up my mind. Love the green, blue and orange set. I am due Sept and would love our new baby to have the bright baby gray crib bedding. It is the perfect gender neutral! I like the Sandbox Crib bedding. The Coral and grey set would be perfect! I love the Sweet Damask Lace bedding. We are doing a pink an gray theme and it would be perfect!! Oh I cannot decide which one i love the most they are all so wonderfully done! What such good choices! I love them all! I love the Lacey Dot Crib Bedding! So pretty and simple! I’m in love with the Pink Truffle set! It’s perfect for the little girl I’m expecting! The coral and grey bedding is beautiful. The Bright Baby Gray, Coral and Gray, and Ikat Citrus are my favorites if I must narrow it down. I love the vintage grey bedding! I like the Carey bedding. The Coral and Gray Crib Bedding would fit perfectly with our little girl’s room! I love all of them and I’m hoping for a girl so the Primrose Rose and Londyn bedding! I like the lime, orange, and aqua bedding. The coral and grey set and coral and aqua sets are adorable! So is the woodland animals. So many choice how does one pick?!? I would LOVE to win a crib bedding set. I have been looking everywhere and they are so expensive! Too expensive for a college student. I find out this friday if the baby is a boy or girl….so I don’t know which one to pick! I love the woodlands crib set. The yellow and gray print are perfect! I like the Aqua and Coral bedding set. We aren’t finding out what we’re having and it would fit boy or girl! I love the ruffled bedskirts! I really would love the Ryleigh bedding! I like the londyn crib set. I love the Gage bedding – so fun and colorful! I love the lavender, lace, and primrose bedding. Wow! I am honored that Caden Lane used my bedding design for inspiration (see Project Nursery’s Graham’s Bright and Modern Nursery)! I would love to win a bedding set for my sister! I’m expecting a little boy this October and I’m in love with the Navy and Green crib bedding! I like the coral and grey set. I like the Cade bedding set. I would love to have this bedding set: Luxe Blue Damask Crib Bedding! Ilike the Sandbox crib bedding. I’d love the Sophie bedding! Love the Green and Navy Polka Dot! Love the Bright Baby Gray!! Or also these: bright baby gray crib bedding, bright baby green bedding, preppy navy boy or the Luxe Blue Damask Crib Bedding. The sweet damask lace crib bedding is adorable!! I would love one of these crib sets for my new arrival! The designs are all so beautiful! I really like the Lacey Dot set. The Baby Gray set is GORGEOUS! Gender neutral = perfect for multiples! Very classic design. I like the coral and gray! I would love to own the Carey Bedding set! I love the red circles and stripes! I like the coral and gray and the Ikat coral bedding! Either would be perfect! Rylee bedding is very pretty! I usually always go for the simple bedding but, since I’m due with my 3rd girl I am really starting to look outside my comfort zone. I really like the Plum Crazy Flat Skirt Crib bedding! I LOVE the pink and aqua floral bedding! I love the gage bedding. Great colors and contrast of fabrics. I love the Avery bedding set! i like the Carey bedding! I love the coral and grey crib set. So cute. So many beautiful sets! Love the Hayden bedding and the Preston set. I love the Lila Bedding! I love the woodland crib set!! I’m in love with the pink and gray “Sweet Damask Lace”! Love all the layering… they all feel organic and not so matchy/matchy! LOVE LOVE! I love the Parker bedding! I love the Girly Coral Rose! My two favorites are the Ryleigh Bedding & the Londyn bedding sets. I really like the Tanner set for a boy. Aww those bedding are mega cute! Love the enchanted forest bedding. I absolutely adore the Primrose Crib bedding. So chic! The coral and gray is fantastic. 2nd choice is the vintage gray. Prettiness. LOVE the Bright Baby Gray Bedding! Omg! I love them all, so hard to decide!!! For my lil boy, I would love the Jack bedding!! I love the Coral, Aqua and Grey bedding! Great for boy or girl! The coral and aqua set is so cute! I love the ruffled bedskirts! Hard to choose a favorite, all are really cute! My favorite is the enchanted forest bedding set and bumper. I love all the fabrics and colors! Love the coral and gray. So many to choose from! Love all the prints and colors. Ikat Pink Chevron…I’ve wanted it for over a year now! The Bright Baby Gray set is perfect!! The lime, orange and aqua would be just perfect for the nursery I’m planning! I love the Vintage Gray bedding…it’s gray and yellow, perfect gender neutral colors!! I would love to win this for my baby’s room! I would love to win the Lila set for my baby girl! I love the 2–Primrose Crib Bedding Set & the Girly Pink Leopard Crib Bedding!! My baby girl is due Sept. 6th!! I would love to win the Asher crib bedding set! We aren’t finding out what we are having this time! So I’ve gone with yellow, grey and white for his or her bedroom and will throw in other colours as accessories to suit the gender after he/she is born. I would probably go with the Bright Baby Gray Crib Bedding or the Vintage Gray but it would be so hard to choose! I really like the Cade bedding. I love the primrose bedding! These are so cute! Plus realistically they could be worked into any boy or girl theme :) I love them! I love this bedding! My daughter’s room is already coral and aqua, and this bedding is so much nicer than the set we have! I love the Ashlyn bedding! Today , I like the Dylan Bedding……but I saw several others I like…. The lime, Aqua and Orange is adorable! I would absolutely LOVE the Lime, Orange, and Aqua crib set!! I would live the plaid bedding from the boutique collection! It fits our little mans nursery colors perfectly! I love the Coral and Gray. Feminine w/o being fru fru! My choice is the Bright Baby Gray Crib Bedding. Love the mix of colors. So many choices, I don’t even know how to pick a favorite. I like Bright Baby Grey Crib Bedding. Love the gray and coral set! Perfect alternative for my new baby girls room instead of the traditional pink or purple. These are all so cute and unique, hard to pick just one! I like green and navy polka dot!!!! The navy polka dots is exactly what I’m looking for! Love the Sweet Damask Lace Crib Bedding… so sweet and soft! Ryleigh or Asher — our baby’s gender is a surprise so it would depend on what we have! Thanks for the opportunity! i love the girly zig zag! so pretty! I Love the Preppy Navy Boy crib bedding! I like the Cade bedding. Love Love Love the Lila Bedding!! So cute! I like the Gage Set! Love the colors and mix of patterns! Love the green and navy combo, and the orange and turquoise – so cute! The Cade collection is great! The Pink Ruffled Chevron is so beautiful I could cry! 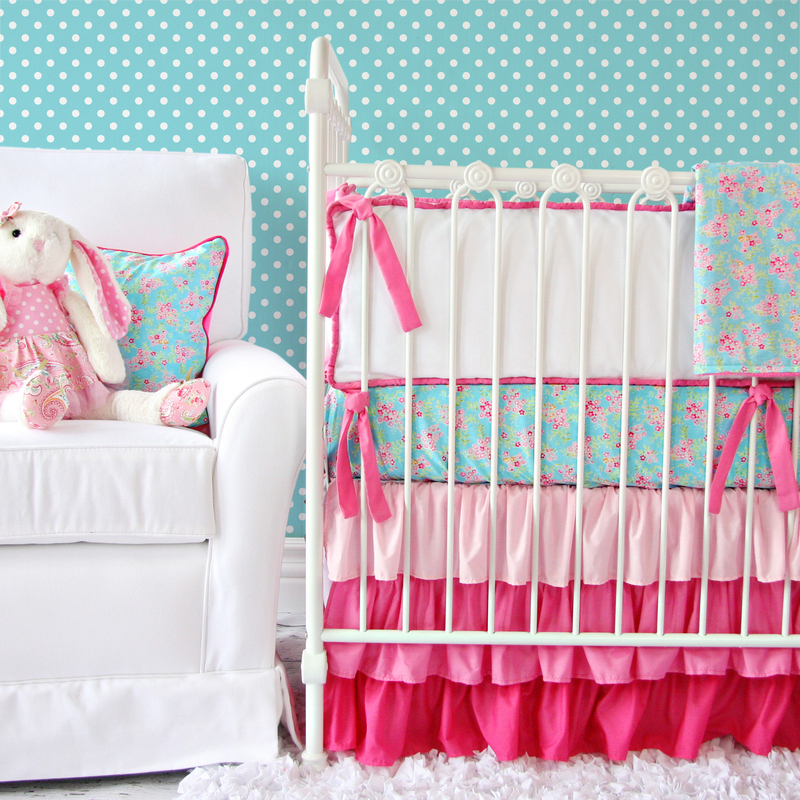 I would LOVE to have that gorgeous bedding in my baby girl’s nursery! Too cute! I love the mixing of patterns! The coral and gray crib bedding is my fave! I would love the Luxe Blue! Too many to choose from! Love the Sweet Damask Lace, Lacey Dot and Bright Baby Gray sets! I like the lime, orange and aqua bedding! I love the Ashlyn set! It matches the Caden Lane blanket we received and would be perfect in the nursery together. LOVE the coral and aqua and the pink chevron with ruffles! I love the Avery bedding, and so many more of them too!! I like the Dylan Bedding, it’s super cute. Love the coral and gray! Just had a baby and would love to win this to decorats the nursery. I love the purple garden bedding. I like the coral and gray set. Super Cute!! Oh my goodness… so hard to pick! We are having a little girl named Ruby Anne, so I think the Girly Coral Rose would be so perfect for her! I would choose the Carey Bedding set. love the green and navy polka dot bedding! I would pick the Coral & Gray Crib Bedding. Love!!! I love the Cade set for my son Cayden :) Also like the Preppy Navy with the green dots! I would love to win a Caden Lane bedding set! Expecting baby#2 in October and I could use the boost to get things done. Thanks for the giveaway! I love the Girly Tiny Bouquet Crib Bedding! This baby bedding is cute, but I went with a jungle theme for my Nicky’s room. We got a great deal at Burlington. It was about $40 less than I had seen it for anywhere else. Would I be able to purchase the pink and red rose set?